Check out some environmentally friendly, healthy and safe cookware, entirely free of harmful chemicals like PTFE and PFOA. Review and buy online! People love their non-stick cookware, with ease of use winning over any other needs, but the chemicals used to achieve these properties have long been suspect to concern. Luckily, plenty of new, eco-friendly, PTFE- and PFOA-free cookware options have become available for sale, using newly developed, or tried and true materials to achieve high-quality non-stick performance without the use of harmful chemicals. Check out the options and find a set that's right for your home. A lot of conflicting opinions have been presented regarding the safety of Teflon and other nonstick coatings over the years, with the manufacturers (of course) claiming their materials are safe, with others claiming the exact opposite. The problem generally arises at higher temperatures. PTFE begins breaking down around 500° F (260° C), and can release harmful gases, which are lethal to birds, and can cause flu-like symptoms in humans. 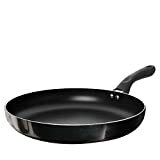 This rarely happens when cooking, and most vegetable oils will start smoking at a much lower temperature, but it's not out of the question that an often-used frying pan will start degrading, exposing the white material underneath the familiar black coating, which can potentially cause problems. High heat will bring an empty or almost-empty frying pan up to this temperature rather quickly. Although the EPA has indicated it does not consider this a concern, the good news is that eco-friendly, Teflon-free nonstick cookware is readily available from a variety of manufacturers, and if you're in the market for new pots and pans, you have plenty of chemical-free options. Eco-friendly cookware can achieve nonstick properties by using newly developed materials, or going back to tried-and-true methods such as ultra-smooth ceramics. By using these materials they eliminate the use of harmful chemicals, and generally lower the CO2 footprint of manufacturing the products as well. However, many of these products are relatively new, and receive mixed reviews, so be sure to shop around first, especially as the market changes. Some of the most consistently praised products are the offerings from Ozeri, Scanpan, American Kitchens and Beka. The Green Earth pans by Ozeri achieve their nonstick through a type of ceramic dubbed Greblon, and are thus entirely PTFE and PFOA free. The pans are made of anodized aluminum, with a heat-resistant handle, a green outer coating to reflect their green construction, and work with induction stoves. Ozeri claims the German ceramic allows cooking with only half the oil compared to regular pans, and higher scratch resistance as well. The pans use a textured surface which allows tiny air pockets to circulate heat under the food, helping to cook the food evenly. The Ozeri pans also manage the achievement of having some of the most consistently high ratings of any nonstick cookware, eco-friendly or otherwise, which is quite an achievement given the difficulty in constructing a product that will please everyone out there. The pans are also available in certain sizes in a smooth finish, which might be better for certain types of foods, such as eggs, though not altogether necessary. Click for more options at Amazon! As one of the heavyweights of the world of cooking, Cuisinart manufactures a wide variety of eco-friendly, nonstick cookware. This includes pots, woks, and dutch ovens in addition to frying pans, so you can get a full set of matching green cookware from Cuisinart. The material is ceramic-based, with a water-based finish, and available in several materials (aluminum, anodized aluminum, and stainless steel). Cuisinart also uses quite a high proportion of recycled materials in both the product and its packaging, reducing its footprint further by reducing consumption of raw materials. 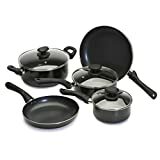 Reviews are mixed, however, with a large number of users claiming the nonstick performance drops off after a few months. Better to try one at a time to see how it holds up with what you throw at it before investing in a full set (and remember that this is a fairly new technology, and improvements are inevitable). Saucepans and stockpots fare much better, as boiling water is always easier to handle than frying things. 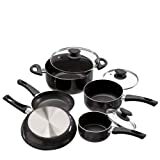 The Ecolution Elements and Artistry cookware sets are comparatively inexpensive when standing alongside some of the other options out there, and are available in a full set of cookware, from frying pans to saucepans to dutch ovens. Both sets use the same materials, having only cosmetic differences, and feature a water-based Hydrolon finish, made without harmful chemicals. They also use recycled materials in their construction, and use aluminum for quick and even heating. Reviews are mixed on their performance, however, citing eventual damage that interferes with the non-stick coating, loosening handles, and inability to use with gas stoves. While the Ecolution eco-friendly cookware sets are pretty cheap by any standard, they might be more appropriate for lighter use, rather than heavy-duty cooking. If in doubt, pick up a single pan and give it a try for a few months. 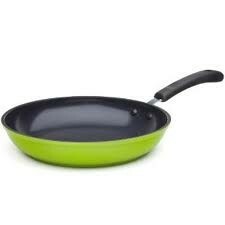 Also, check out the "heavyweight" Ecolution pans, which are far more beloved than their cheaper counterparts. Moving into the higher-priced range, the Scanpan Classic and Professional series feature a ceramic and titanium finish that is entirely free of harmful chemicals, made of evenly-heating aluminum, and garnering far better user ratings than many of the cheaper options listed above. While certainly not cheap, they are backed by a lifetime warranty, are oven and dishwasher safe, and are one of the very few nonstick products capable of advertising itself as suitable for use with metal cooking utensils. This is definitely in the "long-term investment" category, and users are happier with how these pans hold up than some of their competitors'. The Classic series, while marginally more affordable, doesn't get the same near-unanimous praise as the Professional series, though it carries the same lifetime warranty. Click for more options to buy at Amazon! A relative unknown in the marketplace, the American Kitchens PTFE and PFOA frying pans get some pretty unanimous praise from the people who have managed to try them, and they're not particularly expensive, either. 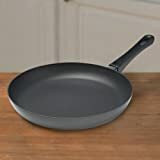 Made of stainless steel with an aluminum core for easy heating, oven safe, and backed by a lifetime warranty, the American Kitchens frying pans seem to be one of the best deals out there, and significantly cheaper than some of the better-known brands whose pans are up to twice the price. They work with induction stoves, too. Click to buy from Amazon! Another non-entity in the cookware market seems to have done something right, with pretty strong praise among its customers. The pans are built from stainless steel, include an aluminum core for even heating, are dishwasher and oven safe, and work with induction stoves. The nonstick surface is ceramic, PTFE and PFOA free, award-winning, and backed by a 3 year warranty. Click to see more at Amazon! With plenty of options on the market, and the market expected to expand in the near future, you'll have lots of choices to choose from. So find out which one is right for you, and enjoy the benefits of eco-friendly cookware without any PTFE or PFOA, or other harmful chemicals. Remember that if you're willing to look after it as necessary, cast iron is one of the longest-lasting, most environmentally friendly products you can find. In fact the iron that leeches into the food is actually healthy for you, unlike Teflon and similar products. They won't be nonstick, but they'll last forever. Because cast iron is always PTFE and PFOA free! I'm always looking for eco products. I don't want to be part of these people who are destroying the world we live. I'll buy Beka Chef. I really loved it. A lot of specialists say that Teflon might be harmful to your health in the long term. Honestly, I've never seen anyone die or be seriously ill because of Teflon. I believe Scanpan DOES have PTFE see their site. Sooner or later we'll have it all figured out and no one will have to worry about it. Someday. I actually knew that fumes from teflon can be harmful and even fatal for birds, but I had never made the natural leap towards thinking about the harm it could potentially cause us. A while ago I wanted a new frying pan. I really didn't want another cheap non-stick pan, only to loose the non-stick properties. I wanted a cast iron pan. Building a basic but functional collection of kitchen tools does not have to be very expensive or complicated. Here are suggestions for a core set of pots and pans.